In some of her recent work, Milton has put symbolic figurative images in mystical landscapes that were inspired by her interest in medieval iconography and early Christian symbols. Milton works mainly in oils and loves the buttery feeling and transparency that oil paints produce. She will occasionally work in mixed media and thereby further emphasize heavy texture and total abstraction. 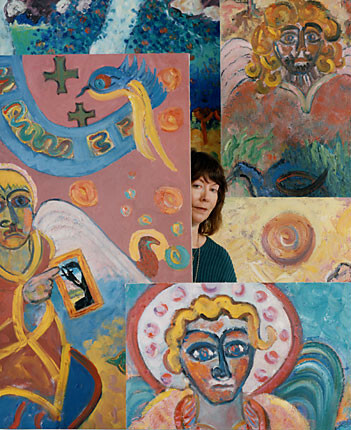 Carole Photographed Among Her Angels attempts to illuminate Milton’s quiet and reflective personality, while at the same time capturing her sense of whimsy. The photographic portrait illustrates many of the goals Focus on the Masters strives to achieve. It depicts artists emerging from behind their art. This specific portrait also symbolizes the travesty of many women being overlooked throughout art history. As one first looks at this photograph, you see only the paintings and not the artist.